The Gallions Quarter is set to be developed by a joint venture between Galliford Try Partnerships and Notting Hill Genesis. 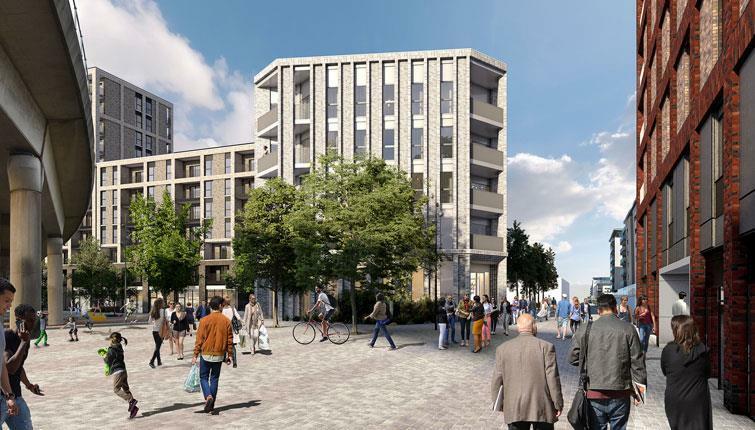 The second phase of the Gallions Quarter development near the Royal Docks in London has been given planning permission. The project is set to be developed by a joint venture between Galliford Try Partnerships and housing association Notting Hill Genesis. The planning decision grants permission to build 241 new homes in three new apartment blocks, alongside more than 1,500m2 of non-residential space. Of the 241 homes, 47 homes will be affordable rent, 48 available for shared ownership and 146 for open market sale. The site will include a new public square, new recreation areas, shops and cafes. The wider Gallions Quarter project, which is located between the Royal Docks and the River Thames near Beckton, will eventually provide up to 800 homes. AHMM and Maccreanor Lavington were among a team of architects chosen to design the masterplan for Gallions Quarter in 2011. The London Development Agency selected the team, which also includes Feilden Clegg Bradley Studios and Muf Art & Architecture. Gallions Quarter is also part of the wider Royal Albert Wharf regeneration. Once complete, the entire area will provide more than 1,800 new homes.